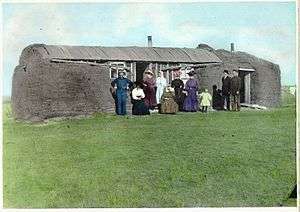 The sod house or "soddy" was a successor to the log cabin during frontier settlement of Canada and the United States. The prairie lacked standard building materials such as wood or stone; however, sod from thickly-rooted prairie grass was abundant. Prairie grass had a much thicker, tougher root structure than modern landscaping grass. Construction of a sod house involved cutting patches of sod in rectangles, often 2'×1'×6" (60×30×15 cm), and piling them into walls. Builders employed a variety of roofing methods. 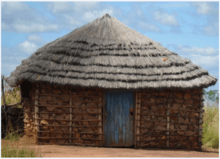 Sod houses accommodate normal doors and windows. The resulting structure was a well-insulated but damp dwelling that was very inexpensive. 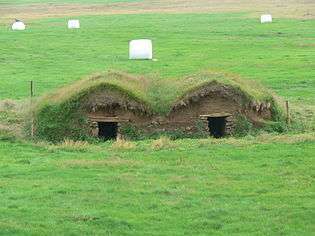 Sod houses required frequent maintenance and were vulnerable to rain damage. Stucco or wood panels often protected the outer walls. Canvas or plaster often lined the interior walls. 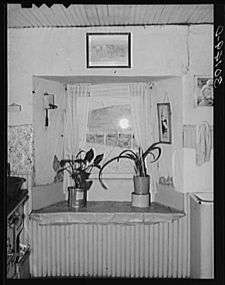 Wikimedia Commons has media related to Sod houses.